Before I came to Japan, almost 6 years ago, I had to face a dilemma. After having been accumulating comics for nearly 10 years and reading them from time to time, I started feeling some intimate links with a few of them. What would you do with your collection of comics if you had to move faraway?. 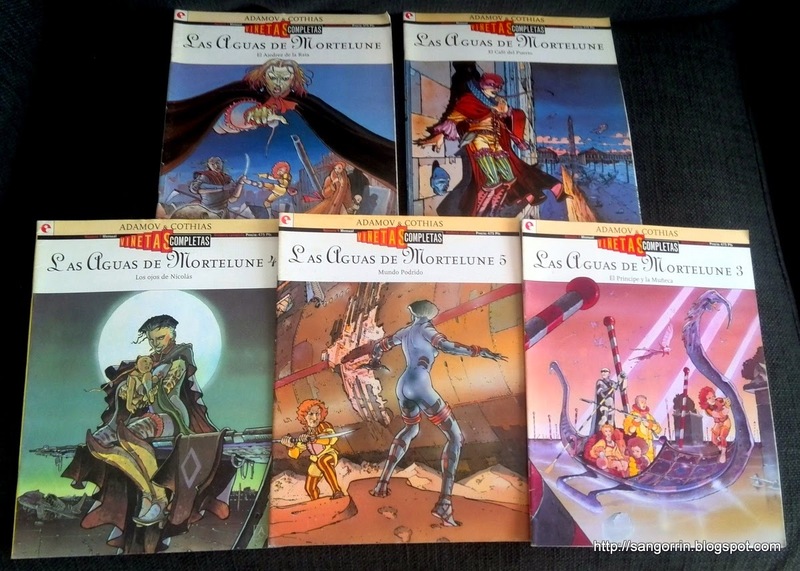 For example, Las aguas de Mortelune (Les eaux de Mortelune). It was the first comic I've ever read, thanks to a friend from high school (thanks a lot Adrián!). I guess I could have got rid of the ones that I wasn't so intimate about, and just bring the rest to Japan. However, I was very much afraid of discarding comics that could lead me to regrets later on. That was really a nightmare, so I decided to postpone my decision and instead, I asked my father to keep them in his rental garage for a few years until I figured out what to do with them. 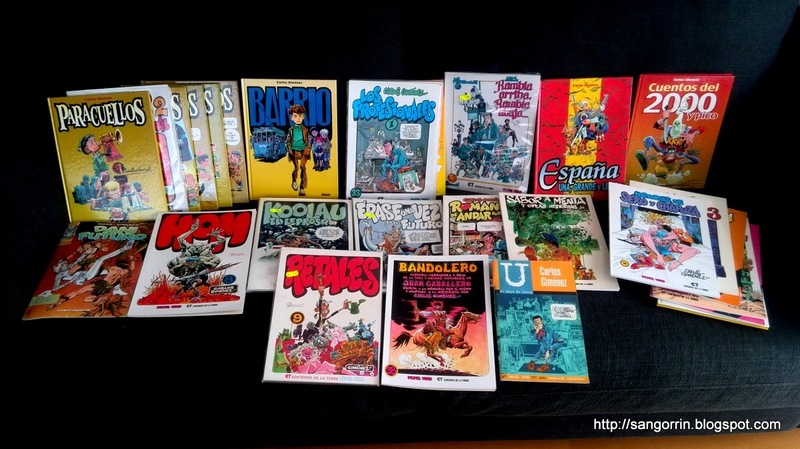 Every year I visited Spain I would also take a look at the state of my comics. The garage conditions weren't good for them and made me sad. But on the other hand it was hard for me to send them back to Japan since I didn't even know what my future would be like. Finally, two years ago I decided to take action. During a holiday in Spain I spent hours and hours classifying comics according to how bad would I feel if I threw them away. Really, it was a very bad experience. I can remember myself at night, a rainy night, taking the not-so-loved comics outside of their boxes and throwing them away. After coming back to Japan I felt gloomy. I started thinking I might had thrown more than I should have, including comics that I actually liked or used to, which was as important. To make things worse, it wasn't until last year that I sent them over to Japan. It was a bit of a hurdle since I had to pay more than the actual price of those comics, but it was well-paid money. Now I'm reunited with them and they are part of me. This is what I consider the core of my first 10 years of love for the art of comics. 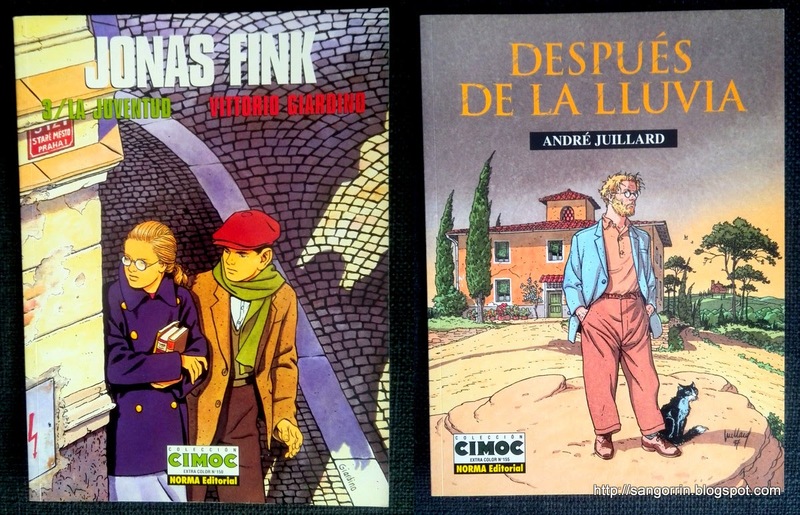 Imaginario (by Horacio Altuna) was my second comic after Les eaux de Mortelune, and I borrowed it again from my friend at high school. I was instantly a new absolute fan of Horacio Altuna. I read Imaginario several times and simply loved it. The more I read it, the more I paid attention to the details. A few years later, I would have the honor of talking to maestro Altuna and showing him some my early drawings for advice after a talk that he gave in Santander. On the same high school, the author Alfonso Font came once to teach us how comics were created. I remember his talk very well. 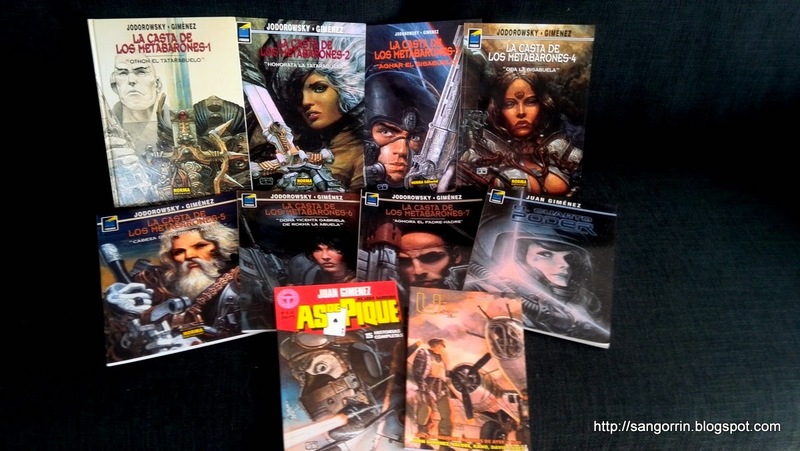 Alfonso Font is a great author and I really love his short science-fiction stories. I lived in a small village so I didn't even know there could be shops that sold comics (this is quite unthinkable here in Japan). But by suggestion from my high school friend I got subscribed to an excellent mail-based comics catalog (at the time I didn't even thought about buying on-line since I didn't even have a computer). One of the first comics I bought was 'Museum' by Fernando de Felipe and I really loved it. Next, I became a fan of Juan Giménez's drawings and stories. His spaceships and futuristic battles are still some of the best I know. I had the honor to talk to him during a visit to the Barcelona comics festival. Again, my friend from high school (seen it in retrospective he was a great influence for me) suggested me to try reading a comic called 'Torpedo'. I did as he said, and then I couldn't stop loving Abuli and Bernet, the authors of Torpedo. I also had the luck to talk to them when I visited the Barcelona comics festival and got a small drawing from Bernet. Thanks. As I read comics, I also practiced my drawing abilities. It was then when I discovered Milo Manara with his perfect women and anatomy. I enjoyed some Manara's comics more than others, but in general there was always a minimum level of quality that was already worth the read. I think my favourite manga by Manara was 'El rey mono' and 'Camino oculto' on which I have a small drawing by him, thanks. Then, I was about to start University when I found some amazing comic covers in an audio magazine. I had never seen anything like that before, the drawing was different and it was a very clear style I could distinguish from any other comic I had read so far. 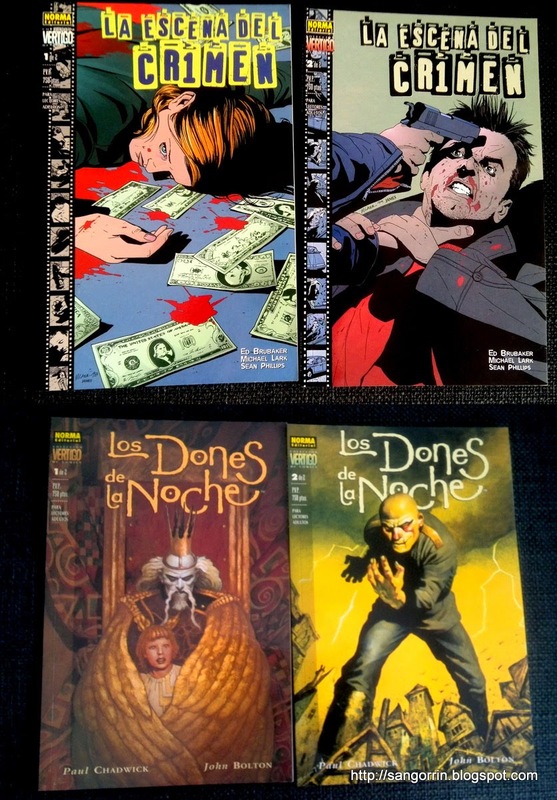 I placed an order from that magazine and that's how I got my first comic made by the great master Carlos Giménez. Soon after that, I was awarded with the honor to spend one month in Barcelona as a learner in an animation studio called Dibutoonz. During that time, I was able to get hold of quite a few of Carlos Giménez works at Mercat de Sant Antoni, such as Los profesionales or Sabor a menta. Reading all those comics about Barcelona in the 80's while I was actually living in Barcelona was an amazing experience that I will never forget. 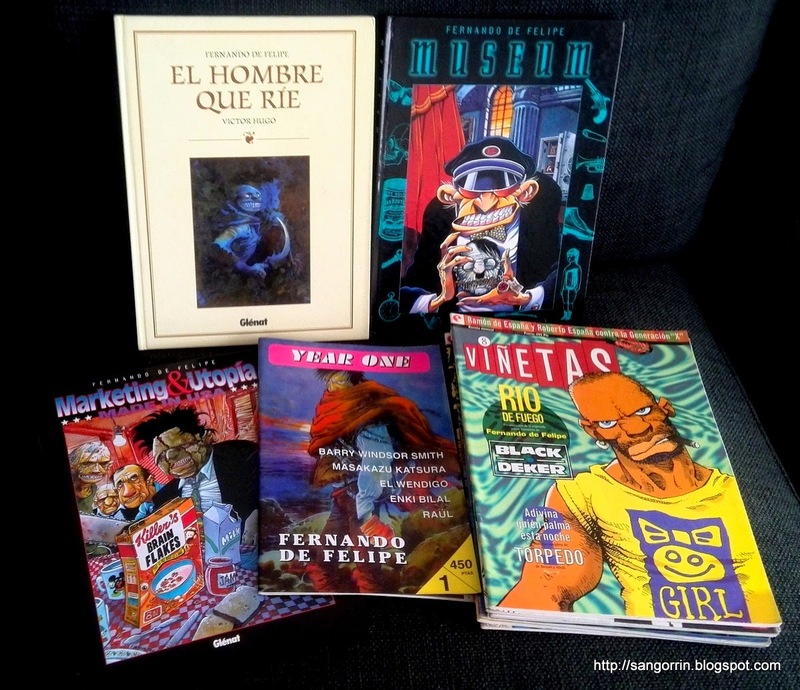 Years later, new editions of Carlos Giménez works were sold again and I could get some of the comics I hadn't found before such as Paracuellos or España grande y libre. I have read many comics from many different countries, and I believe that Carlos Giménez is one of the top comic artists of all history. Finally, I'd like to mention Miguelaxo Prado. An artist with an exquisite delicacy in the way he uses colour. I'm glad I could see him drawing during the comics festival at Avilés. 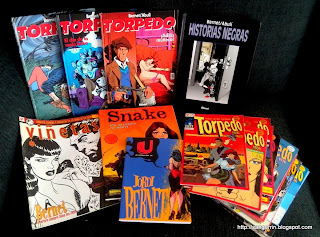 Adamov, Altuna, Font, de Felipe, Bernet, Manara, Juan Giménez, Carlos Giménez, Miguelanxo.. I was really very lucky for having such great masters to lead me in the world of comic. They represent a reference for me and constitute my greatest influence to day. When I started University, I had to leave my small village everyday for the small city of Santander. It was then when I discovered that comic shops actually existed!. For most people reading this blog it might seem stupid but I was living in a small village and I hadn't had a computer until then. 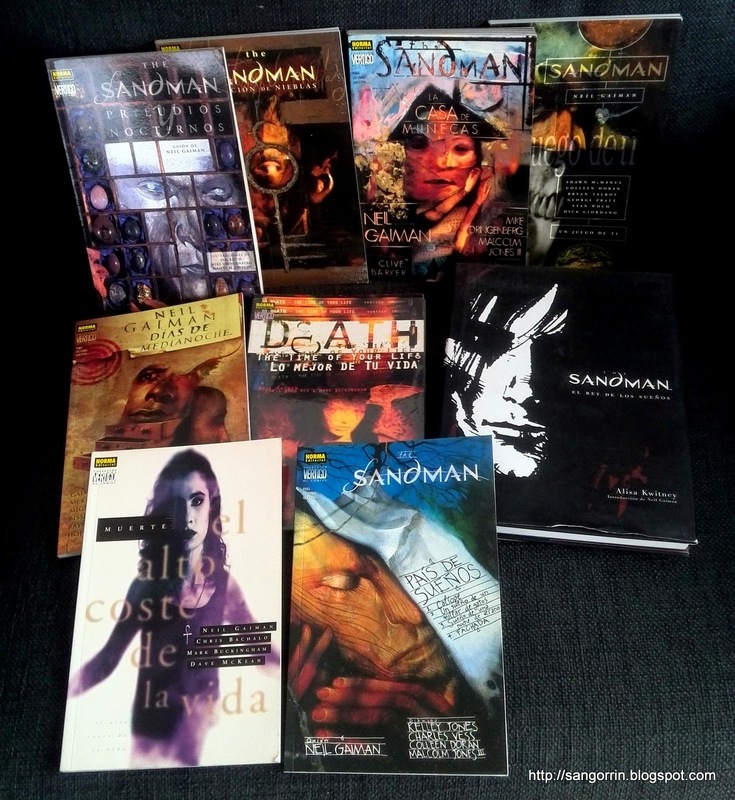 The city of Santander has had at least 3 comic shops that I know of. That's quite more than I would have expected. It was like a dream for me, entering into a shop and seeing thousands of comics around. Comic shops in Spain are usually divided in 3 main parts: European, American and Japanese. Or that's what it looked like the first time I entered to one. 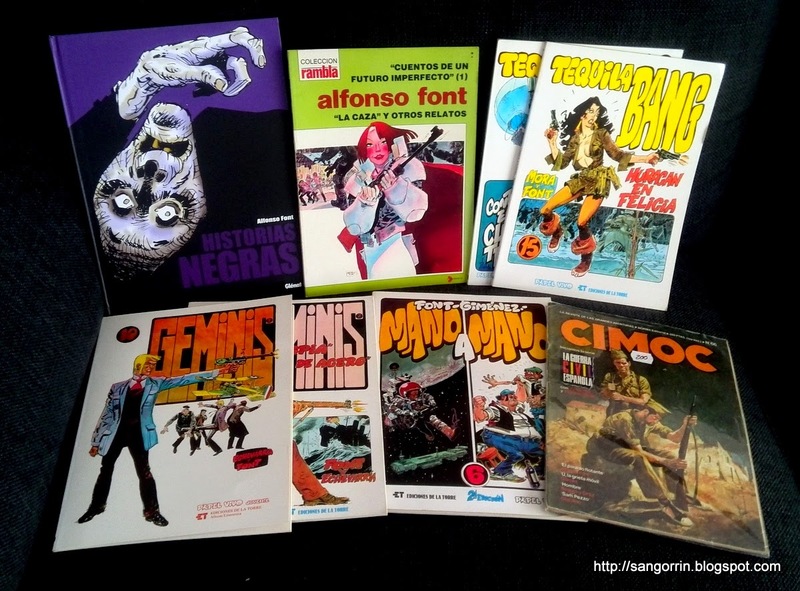 Since my background was in European (and south-american) comics, I started buying comics from there. The ones above are some of my favourites, though there are many others I love that I didn't show. After sometime, I noticed that European comics were quite more expensive than American ones so I gave them a try. I have to admit that I didn't really enjoy most superheroe-related comics (with some exceptions such as Watchmen). In contrast, I started to love the comics that had the brand 'vertigo' stamped on them. Among them, the ones above are some of my favourites. I had the chance to show my drawings to Michael Lark, the artist from The scene of crime, in the festival of comics at Avilés. He told me: try to simplify your lines. I think that's one of the best advice I've ever received. Once I had read lots of European and American comics, I started getting interested in Japanese Mangas. 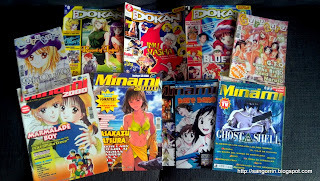 At the time, it was really hard to find Japanese mangas, it wasn't quite a boom like now. But in retrospective that was again a lucky thing. The reason being that I was able to witness how the Japanese manga boom invaded the comics market and that was very exciting. Some early fans started selling magazines such as the ones above with a rather professional look. I learned a lot from them, thanks!. Then, they started putting modern anime in TV such as Marmalade boy. You could feel that Anime and Manga were the cool thing at that time. Soon after, the best mangas started arriving in Spain, like the ones by the great Japanese master Taniguchi Jiro (mostly unknown by his own comrades). Taniguchi's mangas were delicate, sophisticated and very human. Another manga that I loved was this one called Tetsujin Gamma (Yasuhito Yamamoto). Unfortunately, it wasn't that popular in Spain and got cancelled (now I can read in Japanese!). Some other mangas I loved were Akira (Katsuhiro Otomo), I''S (Masakazu Katsura), Monster (Urasawa Naoki), Detective Conan (Gosho Aoyama), Maison Ikoku (Rumiko Takahashi), and anything by Wataru Yoshizumi. 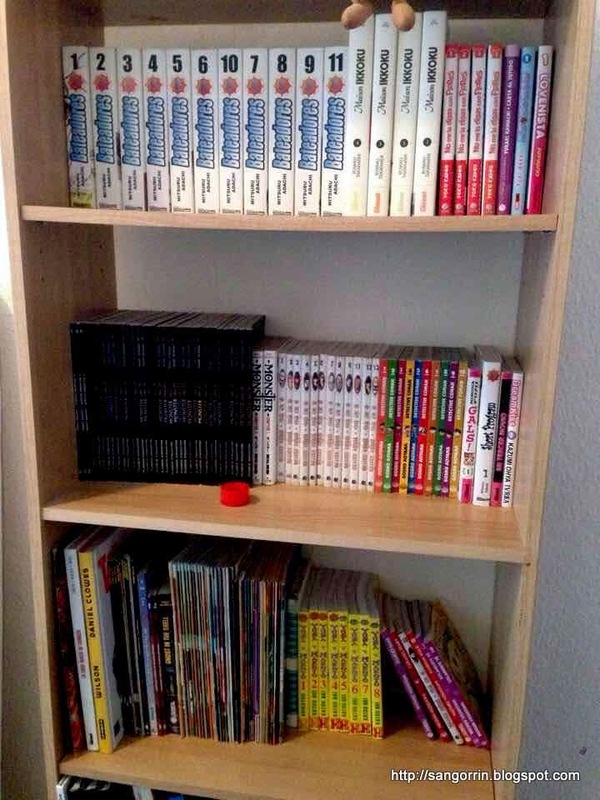 I think this post summarizes quite well what my collection of comics looked like during my first 10 years. At some point in the future, I'd like to talk about what types of comics I have read since I came to Japan 6 years ago. Until then! !